You don’t need the new year to make resolutions and because of that, I’m making one right now. By the end of June next year, I’d very much like to finally be fluent in French (or at least spoken French). And by fluent, I mean not needing to translate English into French in my mind before speaking it, understanding the individual words French people are saying the moment I hear it and being able to discuss things in French. And since my French classes don’t begin till a couple of weeks from now, I guess what better way to kick off the blog’s French Friday series than with food? Monsieur Ratatouille and I spent a Saturday afternoon making our very own cauliflower and potato soup with roasted mushrooms – all from raw ingredients, and no stock included. Yes, I’m actually very proud of myself because I managed to also get potato cubes and roasted mushrooms in this otherwise mashed up dish. We got the inspiration from this recipe on Marmiton, which was just to make a simple soupe gourmande au chou-fleur. In the original recipe, they used lardon but we switched that with sliced ham instead, since we didn’t have lardon lying around like how people do in France. Basically, we boiled some potato halves, onions, whole garlic cloves and cauliflower florets (broken pieces of cauliflower) in a small amount of water (just enough to cover the potatoes and cauliflower) till they were soft. We added in some herbs, salt, pepper, olive oil and cream to give some flavour to the soup-in-making. Then we added in some of the sliced ham for more taste. In another pot, we boiled potato cubes and the rest of the sliced ham. For this second pot, the potatoes and ham will not be blended with the rest. Once the stuff in the first pot tasted OK and everything was soft enough, we blended everything in small batches in a blender. Then we drained the water from the second pot and added its contents into our soup. We then kept it aside for later. In a frying pan, we roasted our mushrooms with some salt and chopped/crushed garlic, and finally added these as a finish to our soup when served. We topped it all off with sprinkling of basil, and we got a very delectable homemade cauliflower soup! Our idea of lardon. Close enough! With such success, I’m beginning to think I might be able to do this every weekend. But that might be a little too ambitious. Nevertheless, this soup is quite the healthy dish since everything is made from fresh ingredients. 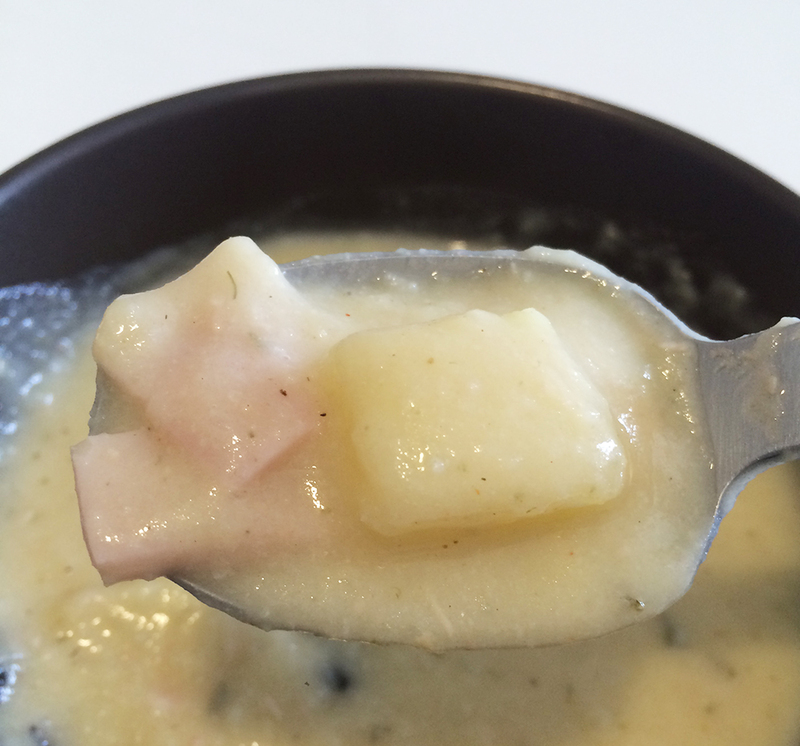 How about you try out this recipe, or share one of yours for a nice soup? We’re always on the lookout for more. 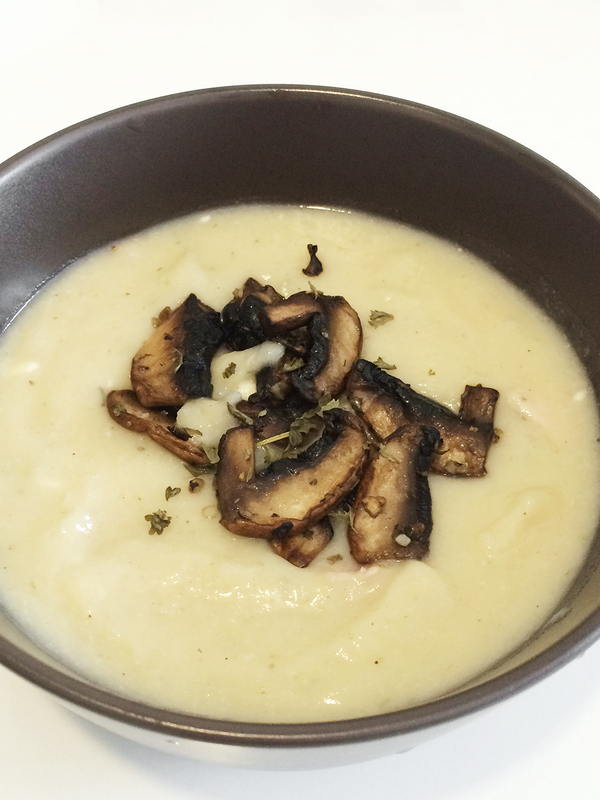 French Friday: Cauliflower Soup with Potatoes and Roasted Mushrooms was last modified: October 13th, 2016 by Roxanne C.